Back when I used to work in Minitab Tech Support, customers often asked me, “What’s the difference between Cpk and Ppk?” It’s a good question, especially since many practitioners default to using Cpk while overlooking Ppk altogether. 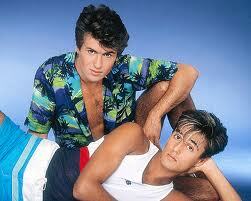 It’s like the '80s pop duo Wham!, where Cpk is George Michael and Ppk is that other guy. Poofy hairdos styled with mousse, shoulder pads, and leg warmers aside, let’s start by defining rational subgroups and then explore the difference between Cpk and Ppk. A rational subgroup is a group of measurements produced under the same set of conditions. Subgroups are meant to represent a snapshot of your process. Therefore, the measurements that make up a subgroup should be taken from a similar point in time. For example, if you sample 5 items every hour, your subgroup size would be 5. For illustration, let's consider a data set where 5 measurements were taken every day for 10 days. As the graph on the left side shows, there is not a lot of shift and drift between subgroups compared to the variation within the subgroups themselves. Therefore, the within and overall standard deviations are similar, which means Cpk and Ppk are similar, too (at 1.13 and 1.07, respectively). Since we used the same data, the overall standard deviation and Ppk did not change. But that’s where the similarities end. Look at the Cpk statistic. It’s 3.69, which is much better than the 1.13 we got before. Looking at the subgroups plot, can you tell why Cpk increased? The graph shows that the points within each subgroup are much closer together than before. Earlier I mentioned that we can think of the within standard deviation as the average of the subgroup standard deviations. So less variability within each subgroup equals a smaller within standard deviation. And that gives us a higher Cpk. And here is where the danger lies in only reporting Cpk and forgetting about Ppk like it’s George Michael’s lesser-known bandmate (no offense to whoever he may be). We can see from the examples above that Cpk only tells us part of the story, so the next time you examine process capability, consider both your Cpk and your Ppk. And if the process is stable with little variation over time, the two statistics should be about the same anyway.